The Choo Choo Trains - I Choo-Choo-Choose You. 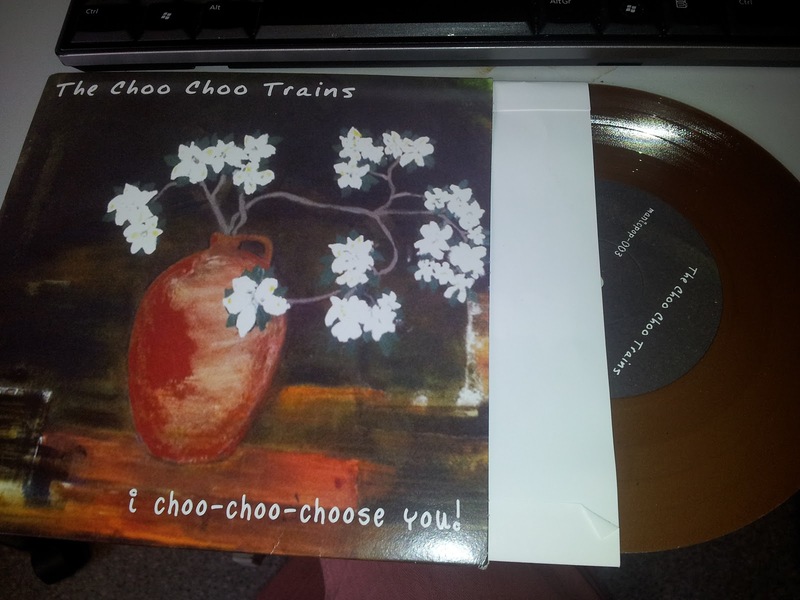 This time I am record reviewing a 7" record with five songs on it from a band from London called The Choo Choo Trains. I don't know much about The Choo Choo Trains except for that they are three ladies called Emma, Catherine and Veronica who make music and I think it makes a nice change to hear music made by women so I am looking forward to doing this review very much. The first song on the first side of the record very good little song called Save Me which is a soft song with soft drums and ordinary guitar where the singer (who has a very nice, light voice which sometimes sounds a bit scottish) is asking someone to save her from a broken heart so it is sort of a love song I reckon - I've never had a broken heart so I don't know what it feels like to have one but I think it would be horrible. I thought that this was a very nice song indeed and a good way to start the record. 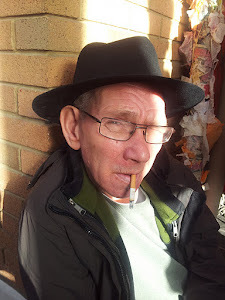 A very good picture of Pete's friend Billy. The next song is called The Most Beautiful Boy and it is a very nice song that is a bit faster than the last one. This one is about a boy who is the most beautiful boy in the world called Billy. 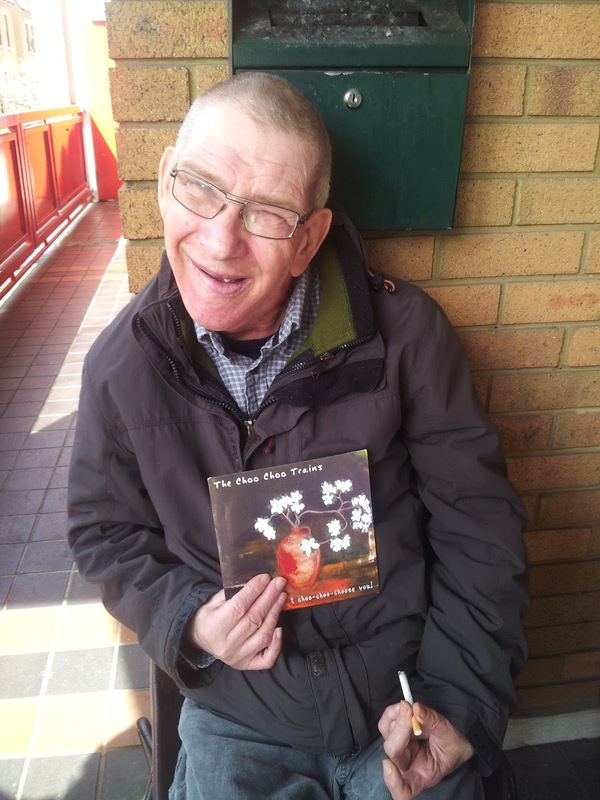 I thought this was interesting because I have a friend called Billy who is very good looking because he has long hair, Billy used to come here to The Gate to do music with us but I haven't seen him in a long time. I don't think this song could be about the same Billy though because that would be too much of a coincidence. This song reminded me a bit of some band but I couldn't think of who it was because my head went blank but it was probably one of those sixties bands like The Pony-Tails who did Born Too Late or The Dixie Cups or The Chiffons. The next song is called Futile and it is a very quiet song indeed with nice piano this time rather than guitar. This song starts sounding quite sad but then changes half way in and sounds happier and carefree - I thought this was a lovely little song. Next one is a guitar song which sounds a bit like The Shadows in a bit which is a good thing because The Shadows made Apache and that's a very good song. Like Apache this doesn't have singing in it because it is an instrumental. I liked this one a lot. After this instrumental is the last song called No.38 to your Heart and it is another piano song and I thought it sounded a bit like a choirgirl singing at a funfair because the music sounds like music you would here at a funfair or a circus. I thought this was a very nice song and a happy way to end the record off. Overall I would say that I thought this a brilliant record with very good music on it that I enjoyed very much and I think other people would like it too because it is very pleasant and a nice change from noisy music - you can hear this record and buy it below. I would give this record 10 out of 10. Comply or Die - Sixes/Three Suns & Depths. 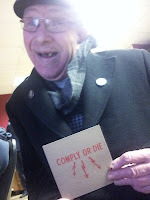 This time I am reviewing a couple of CD's from a band called Comply or Die. Comply or Die got in touch with me because they saw my reviews and asked if I would review some of their music and then they sent me some CD's to listen to and some badges. I would like to thank them for sending the stuff because it's always nice to get things in the post and I like the CD's very much. 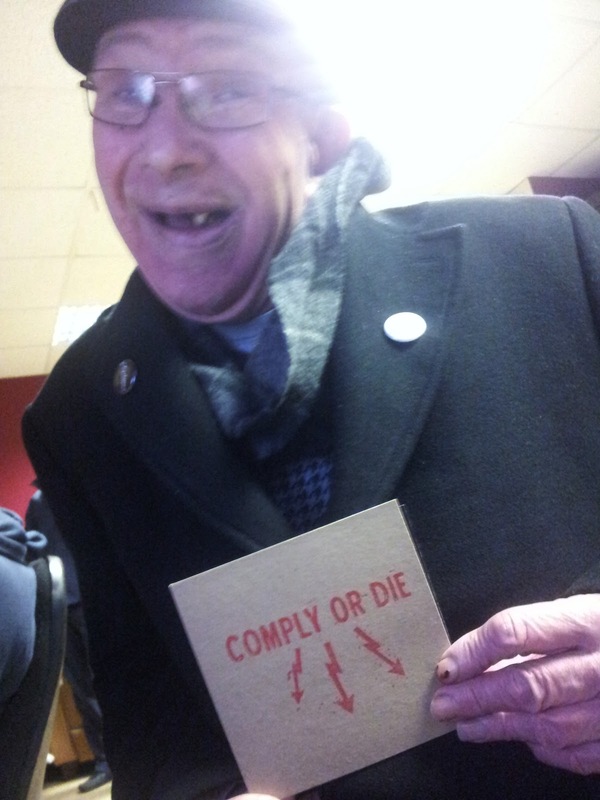 Comply or Die don't sound much like Them though because they are more modern and noisier and more they shout when they are singing and Van Morrison didn't really shout when he sang he just sang like a normal person. The first CD I am going to review by Comply or Die is a short one with just two songs on it called Sixes and Three Suns and I thought it was very good indeed. The first song Sixes is a great noisy fast rock song which reminded me of the punk bands of the late seventies only it's a bit noisier and faster and rockier, it starts off with loud electric guitars and drums and then the singing starts and it is very shouty and I think this is because if it wasn't shouty you wouldn't be able to hear it because the music is such loud music - I think this would be very good music to play at party for people to jump about to. The other song on this CD is also called Three Suns which I thought this was a bit of a peculiar name for a song because there is only one son and I think if there were three suns that wouldn't work because it would be too hot and everything would burn but maybe that's what the song is about. This is another fast rocking song with even more shouting in it than the last one. I liked this one because it has a nice bit in it where the singing stops for a nice guitar solo before everything kicks off again. Overall I would say that this was a really good record and I am looking forward to reviewing the other CD I am going to review. If you think that you might like to hear it you can do on the thing below and buy it from the band for just £2 which I think is very cheap because that's the same price as a bag of chips and I think it's well worth it. I would give this CD 10 out of 10. The other CD that I am going to review by Comply or Die is called Depths and it is an eight song album and like the other CD it is a very good, very rocking CD that I enjoyed very much. 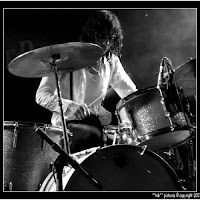 The album starts off with a song called official secrets which is a very fast song and very noisy and very shouty, just like all the Comply or Die songs are and then it finishes very quickly and the next song starts and and I think it might even be faster and noisier and more rocking and more shouty than the last one. The next song after this one gets even louder and is a bit more chaotic than the last one with big drums and noisy guitar and voices which sound like a radio broadcast, I think this one might be one of the noisiest songs I've ever heard and I liked it a lot but I think it is a bit mad sounding which is okay because I think it's okay to go mad every so often. The next song after that last one is a very long song called Vermin which starts off with a big messy noise which goes on for a bit and then turns into a song which is a bit slower than the other songs but just as noisy, it reminded me a bit of the Hey Colossus records that I have listened to because Hey Colossus songs are slow and noisy too. There is a bit near the end where things get quieter and there is a voice which I thought sounded a bit like a martian talking and then it all speeds up and goes all messy again and I thought this was the best yet because it is a very fantastic song indeed which I enjoyed very much. After this long song is another very loud and fast song called I'm Sick (Of This) which I suppose means that the singer is angry at something but it's hard to make out what the singer is angry about because it is difficult to make out the words but I suppose he could be angry with his girlfriend and his friend who might have been meeting up together in secret and the singer is not very happy about it - that's what I reckon anyway but whatever the song is about it is a very nice song indeed and good fun to listen to and make up stories about what it's about. The next song is called Motives and this one is probably the noisiest yet and sounds like there are loads of guitars playing on it but there can't be because there are only three people in the band. I think the only thing that would be noisier than this song would be a plane taking off or maybe bombs going off or something, this one i thought was very good. After this the next song things slow down a little bit and there is a funny guitar that sounds like a robot and talking voices that sound like they were recorded over the phone and then the singing starts but this isn't really a song with much singing in it and is more an instrumental; I don't think it needs much singing though because the music is so good. The last song DMT is another long one and it starts off quite quiet with just quiet guitar that just sounds like ordinary guitar and isn't all loud and fuzzy but then the drums start and after that the guitars get louder and fuzzier but not as loud and fuzzy as they are on the rest of the CD but then it keeps getting louder and louder till it is very loud indeed and very big and rocking, I like how it does this and thought this was a great way to end the record. Overall I would say that I enjoyed this record very, very much and thought it would be good to listen to when you were tired after work because I think it would wake you up - you can listen to it to hear what I mean on the thing at the bottom of this review. 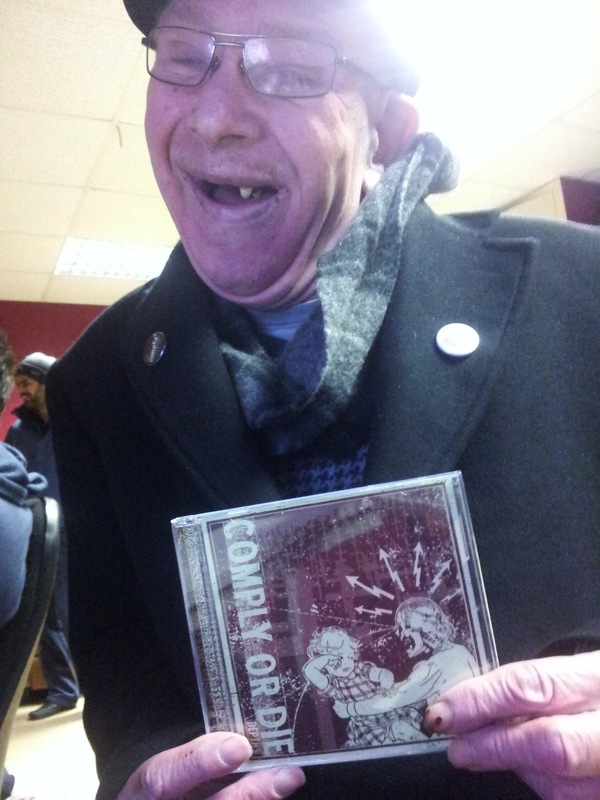 I would give this one 10 on 10 too and would like to thank Comply or Die for sending me it and the other CD's. This time i'm not reviewing a record because I am doing a tape called Orz instead by Joane Skyler who looks like a very nice lady from the cover. 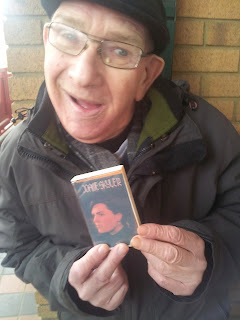 I've not seen a tape for sale in a long time and thought they was a bit old fashioned and that no one used them any more but I think it's alright for people to make tapes even if they are old fashioned because it gives people something to play in their tape recorders. I have a tape recorder at home with some old tapes I still listen to like my Nancy Sinatra tape which I like a lot and a tape somebody made me once with all sorts of different kinds of old music on it. The music on this tape though isn't old music because Joane Skyler is a brand new artist who has never released anything before. Side A of the tape starts off with a noise like an electronic organ and the sound of a heartbeat and then there are electronic drums which sound a bit like foreign bongo drumming and lots of other little electronic noises all mixed up together - it's not messy music though because it is very soft and quite relaxing and very enjoyable and nice and quiet which is a bit of a change for me with my reviewing because recently I have been listening to a lot of noisy music. The music changes after a bit and i'm not sure if that's because it's another song or not because it's hard to tell where the songs end but I think it might be. When the music changes it gets even softer and there are no drums for a bit just a long noise that reminded me of the wind blowing in a tunnel and then there are lots of different electronic noises and drums which keep disappearing and coming back - it is quite strange stuff that changes all the time and this makes it very interesting to listen to. Overall I would say this was a very good tape that I liked a lot because there was a lot of strange different things to listen to and I think other people would like it too. I thought it was a very good first recording from this new artist and I'd like to wish Joane every success in the future. You can buy this tape by clicking the link at the top of this review and hear some other music from Joane here. I would give this tape 10 out of 10.